Enjoy a horse carriage ride or step aboard its fun train in any of the three eye-catching stations, amusingly named after Puerto Rico’s musical styles of Bomba, Plena and Danza. Reasonable prices all year-round guarantee a treat for yourself and your kids in this great city getaway experience. 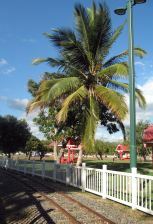 The park, which was inaugurated in 1994, underwent a recent major (USD$19 million) expansion in late 2008. It was dedicated to one of the early forefathers of sports in Puerto Rico, memorable Ponce citizen Julio Enrique Monagas who established the first track and field club on the island (the Ponce Athletic Club) back in 1929. Born in the Dominican Republic, at an early age Julio settled in Ponce where he was raised by his Puerto Rican parents. In 1928 he became the first and finest sports editor to work for a local newspaper (El Día). In the late 1940’s he created the Puerto Rico Amateur Athletic Federation, directed the Administration of Public Parks and Recreation and most importantly, formed the Puerto Rico Olympic Committee. He was the first of three Puerto Rican citizens (besides Germán Rieckehoff Sampayo and Héctor Francisco Cardona) to preside over the Central-American Sports Organization (ODECABE). In 1984, at the 87th Session of the International Olympic Committee he was rightfully awarded an Olympic Silver Medal as the driving force and father of the Olympic Movement in Puerto Rico and founder of its National Olympic Committee. 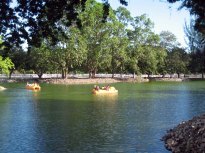 The Julio Enrique Monagas Park is open to the public every day except on Mondays, from 8:00 AM to 6:00 PM (9:00 AM to 7:00 PM during the summer season). Call 1.939.247.9336 for more information or to reserve one of its picnic stands for your private activity.